Woking Football Club is delighted to announce that Ismail Yakubu has signed for the forthcoming season. He played a key role in the Cards’ excellent start to the 2015/16 season, with only 1 defeat in the 6 matches he played, and he scored the dramatic last-minute winner in the 1-0 victory away to Torquay United. Ismail ruptured his anterior cruciate in the match against Boreham Wood, resulting in the defender missing the remainder of the season. He has now fully recovered from the injury, with Cards’ fans helping raise funds to cover the costs of his operation & treatment during the season with a number of fundraising activities. 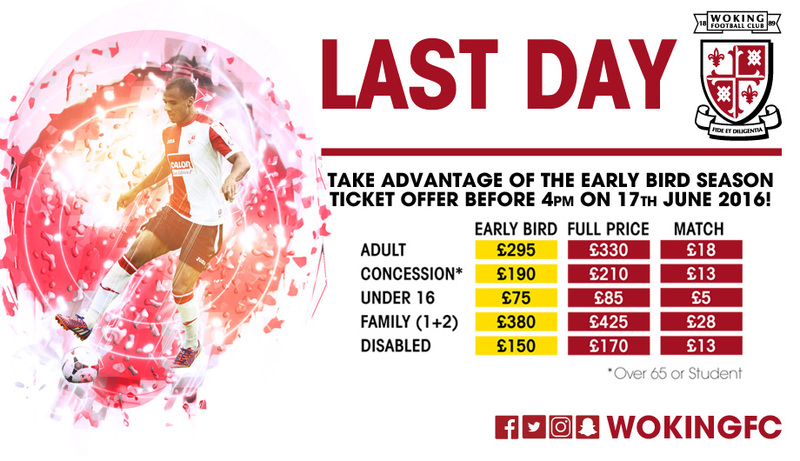 There’s still time to save big on your 2016/17 Season Ticket, with just under a month to go of the Early Bird offer, don’t miss out!